This is part two of three in a series about the upcoming The Art of Tiki show in Los Angeles at La Luz de Jesus gallery. The show is a celebration of the 21 years that have elapsed since the first Art of Tiki show at La Luz, back in 1996. The show opens on Friday, October 6, 2017, and runs through October 29. When I saw that a sale of actual pieces from historic mid-century Polynesian restaurants was also going to be included in The Art of Tiki show, I flipped my lid. I do love the modern-day art, enough that I’d already made plans to get myself to Los Angeles, but this—the history of these places, and the gorgeous art that was produced in creating them—that’s my reason for living. That’s what Critiki is all about. Naturally, I wanted to know more, so I turned to Sven Kirsten, who connected me with the man behind the sale, Jordan Reichek. What follows is a distillation of what he shared with me about how this sale came to be. Jordan Reichek is an animator who worked on Ren & Stimpy starting with the pilot, and has continued to make a career in animation. Jordan has been a lifelong collector of “stuff” but really hit his stride of cool-stuff-acquisition in the late ’80s when he moved from NYC to Los Angeles to continue school, first at USC and then at CalArts. His collecting interests included animation art, figural advertising, coin machines, illustration art, vintage cars, and mid-century furnishings—with his strongest focus on Exotica records, vintage Disneyland, and Tiki. I’m sure you can imagine the amazing things he was able to find at thrift stores, antique malls and estate sales in Southern California in the late 1980s. Oh, for a time machine! Well, I guess Jordan is that time machine, which is lucky for us. His passion for neat thrift store finds from the past was shared with Ren & Stimpy creator John Kricfalusi, and many of their most interesting scores made their way into the show in one way or another. When his collection grew too massive to reasonably house, he made the hard decision to part with his treasures. 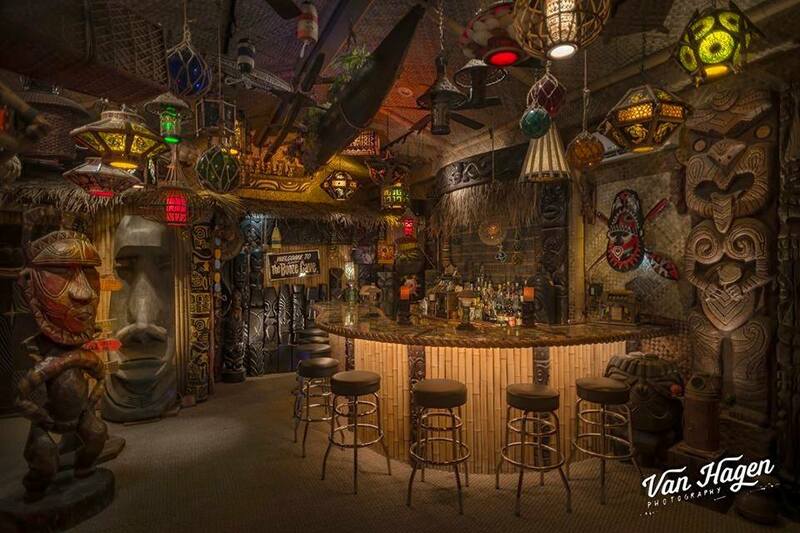 Looking at both his vintage Disneyland collection and his Tiki collection, he realized that it was the Tiki collection that could be integrated into an amazing livable, functional space (what’s more functional than a home tiki bar? ), and so he made peace with the idea of parting with his Disneyana. His vintage Disneyland collection was without equal: actual items from the park, including props, signage, concept art, attraction posters and even animatronic figures, including many from the Enchanted Tiki Room. The practicalities of parting with this collection had to have been daunting, and Jordan found the right partner is his friend, Mike Van Eaton of Van Eaton Galleries. Van Eaton had never handled an auction like this before, and allowed Jordan creative control over how the collection was presented. Most important to Jordan was the auction catalog, a collectible item in its own right, titled The Story of Disneyland (this link lets you browse the entire catalog online). Instead of a sterile listing of the Disneyland objects for sale, he wanted a description of what these pieces had meant to him, why they are important. I love that. Capturing the stories of these objects’ histories and travels, and documenting their relationship with their collector, is much of what drove me to create Ooga-Mooga. The sale of his Disneyland collection in 2015 turned into a celebration, and made the parting much easier. What also made it easier is that the proceeds from the sale helped Jordan buy the home of his dreams, which of course meant he finally got to construct the home tiki bar of his dreams. Now, let’s get to what you’re really here for, and talk a bit about this Tiki collection. As I mentioned, Jordan started collecting in Los Angeles in the late ’80s. All those holy grail mugs people compete for on eBay, spending hundreds of dollars, Jordan was finding in thrift stores for less than a buck. Better yet: his being connected with the early tiki scene in southern California meant he was in the loop when big items became available. Sometimes the sales were “all or nothing” for large masses of items from one location, which meant there wasn’t much competition: Jordan had storage units and wasn’t afraid to use them. When the Kona Kai in Philadelphia and the Kon-Tiki in Cleveland closed, he was able to acquire many one-of-a-kind pieces of decor. He loaded up at the big Trader Vic’s warehouse sale a few years back, and has many Trader Vic’s pieces from other sources, from San Francisco, New York, Washington, D.C., St. Louis, Chicago, Scottsdale, Detroit, and Osaka, Japan, and the original Oakland location. Jordan Reichek’s home tiki bar, The Booze Cave. Photo by Van Hagen Photography. Can you imagine being able to build a home tiki bar with decades worth of tiki finds, any one of them a once-in-a-lifetime score for the rest of us, packed into storage, just waiting for your imagination to place them into the ultimate home bar? Good god. I’m going to need a moment. The bar is called The Booze Cave (version 2.0, the first Booze Cave was a temporary set-up in his rental home). The centerpiece of the bar is a 19-foot-long wave-shaped bar-top with over 1,200 vintage matchbooks from Polynesian restaurants embedded in sand and epoxy resin. Twelve hundred matchbooks! Now that his home tiki bar has finally come to fruition, he has a beautiful problem: what to do with the leftovers. Jordan reached out to tiki historian Sven Kirsten, and Billy Shire and Matt Kennedy of La Luz de Jesus Gallery, and learned the Universe was conspiring in his favor: preparations were already underway for The Art of Tiki, a new tiki art show in celebration of the 21 years since Otto von Stroheim’s original art show in 1996. It’s a perfect pairing: the original Polynesian Pop art pieces that inspires today’s generation of Tiki artists, alongside their new creations. What’s more, Sven’s The Art of Tiki companion book serves as the documentation, a loving expression of what his Tiki collection is all about. I’m particularly taken by this huge bird carving. On the right you can see it in its original home, atop the A-frame entrance of the Kona Kai in Philadelphia. I fully expect to spend the entire show with my jaw scraping along the ground. Sven Kirsten, pictured here with a massive tiki available at the sale, photographed the pieces for their inclusion in The Art of Tiki companion book. Mahalo nui loa to Jordan Reichek for saving these historically important pieces, giving them a loving home for so long, and now sharing them with everyone. There is not yet a complete tally of items and prices for the sale from Jordan’s collection, but these are incredibly rare pieces, expect the prices to be a reflection of that. Come see them for yourself! It’s all happening October 6-29 at La Luz de Jesus Gallery in Los Angeles. The opening night is Friday, October 6. Jordan will be there, and I will, too! Did the entire collection really go to one buyer? According to the gallery curator, there were several buyers. There were a few early buyers of individual pieces, before the whole remaining enchilada got picked up.